Class Action and Phreek were disco and post-disco musical projects. The original Phreek comprised Christine Wiltshire, Leroy Burgess, Patrick Adams, Stan Lucas and others. Class Action was directed by Larry Levan and featured Christine Wiltshire as vocalist. Both groups are best known for their club hit, “Weekend”, written by James Calloway and Leroy Burgess. The 1983 version was remixed by Morales and Munzibai and Larry Levan and produced by Bob Blank and Lola Blank. The song “Weekend” was originally recorded on Atlantic Records by Patrick Adams’ studio group Phreek of which Wiltshire was a member. The song was heavily played by Larry Levan yet it was commercially unavailable so it did not enter any charts. 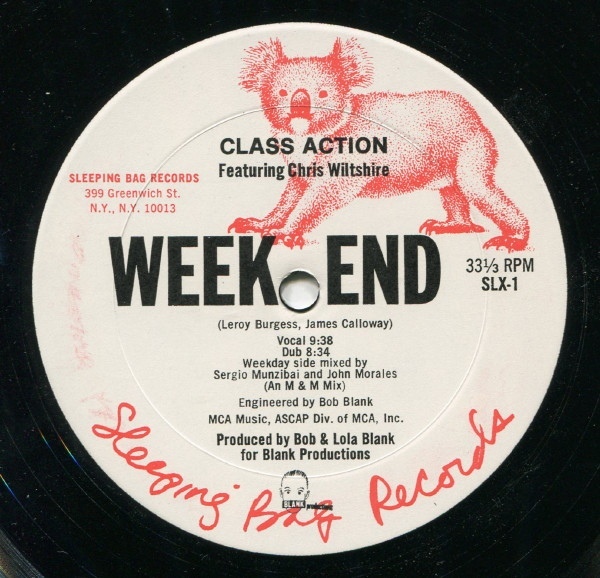 In the early 1980s, William Socolov, the co-owner of Sleeping Bag Records, invited Levan to make a new version of “Weekend”. It became more successful than the original version, peaking at No. 54 on the British pop chart and No. 9 on the Billboard Dance chart.